You will love that this template is so fast and adaptable. 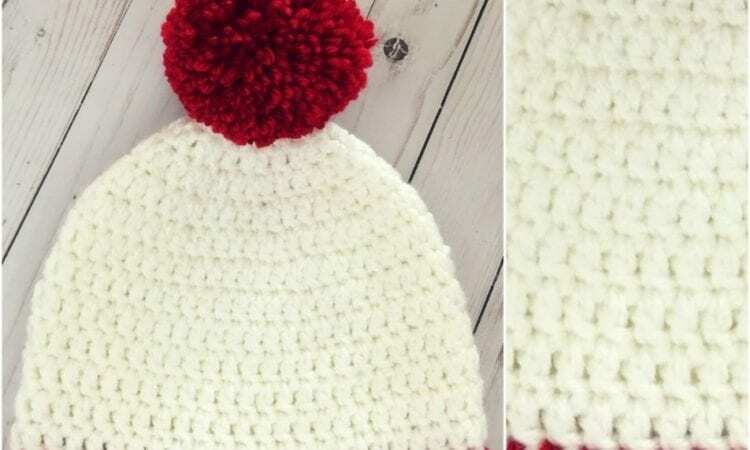 The big pom pom makes it even better and gives it an adorable, festive look either for Christmas’ or Valentine’s. But you can use any color you like. Two strands of worsted weight yarn are used together, so you need less yarn of each color. You could use two strands of the same color or else add a little spice to your crocheting by using two contrasting colors. The link to the full pattern is below. Easy Peasy 30-Minute Beanie – the free crochet pattern is here. For more ideas join our Facebook group.